Designates a spill kit as one used for emergency situations. It covers the lid, and has an Emergency Use Only sticker on the top. A velcro strap around the bin includes eyelets for a tamper evident security seal. Covers are available in the new Spill Kit Standard colours of Grey, White and Yellow. Also available in Red and Blue, other colours are available if required. 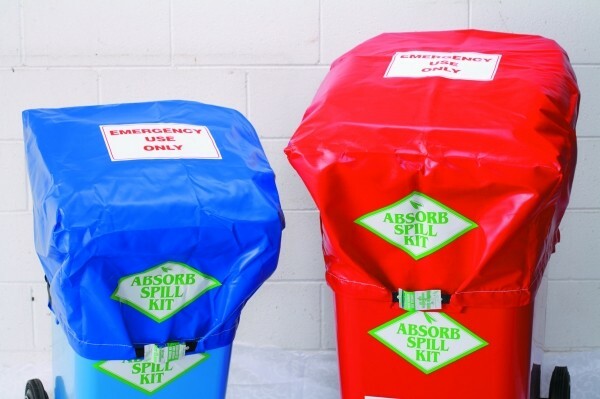 • Emergency spill response having an Emergency Only kit. • Deterring fugitive depletion in favour of emergency spill response. • Easy-to-see broken seal means the kit needs refilling. • Seal must be broken to access the kit. For maintenance incidents, utilise a customised Drip and Leak Centre. • Also helps to deter the kit being used as a rubbish bin. • Ideal for public areas like service stations.